Sikie (seated centre) during the service with Roland (seated second left), Stephen (seated second right), members of the delegation from Australia and army veterans. KUCHING: Youngsters are encouraged to spare time to learn the country’s history and heritage sites. According to Assistant Minister for Arts and Culture Datuk John Sikie these observances are important for peaceful living among the country’s multi-racial society. Speaking at the Twilight Dedication Service held at the Heroes Grave Memorial, Jalan Taman Budaya yesterday, he hoped the younger generation would pass on historical messages to the generation to come. “We are grateful to have the spirit and culture of harmony and peace in our midst to enable us to celebrate meaningfully our shared World War II (WWII) historical heritage. This spirit is an important corner stone that pave the way for the development we achieved since WWII,” he added. 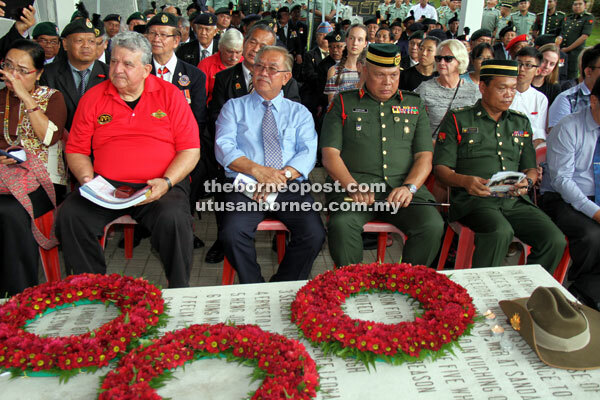 A delegation from the Australian and New Zealand Army Corps (Anzac) and Heritage and Cultural Exchange Students to Sarawak attended the service together with Malaysian army veterans and servicemen. Representing the delegates and the Borneo Exhibition Group, Western Australia, Ryan Roland commented that the service is a reminder of the dark period of the country’s history during the WWII Japanese occupation of Borneo from 1942 to 1945. The solemn ceremony ended with a moment of silence and laying of wreaths at the memorial. Sarawak Tourism Federation (STF) deputy president Jane Lian Labang gave a welcoming speech at the ceremony. She said the organisers thank the Ministry of Tourism, Art and Culture, government departments and agencies, members of the STF Development committee, the army, police and others who contributed to the heritage and organised the service also attended by First Infantry Division Commander Major General Datuk Stephen Mundaw and others.